In our dining room lighting cost guide you will find detailed information and ideas on dining room light fixtures, cost of these fixtures and how to find the person to help you out installing the proper lighting. When you think about the dining room, family dinners, fun time and laughter come to mind. The same way the kitchen is said to be the heart of a home, a dining room carries the same weight. Not only is it used for family dinners, but the dining room is also a multi-functional room that is often used as a convenient place to do homework, play games, a working space, and many other tasks. It is a multipurpose room that draws everyone around it. Seeing that a dining room is an essential room in your home that serves everyone and brings families and friends together, this space should be thoughtfully planned over when it comes to lighting. The lighting should be able to spruce up the dining room space, create a fun environment while at the same time maintaining an intimate feel. In most homes, you will find that the dining room has a traditional kind of setting with less going on as compared to the living room. However, this should not be a reason to have a boring moderate space. Installing the right light fixtures can make a difference in how your dining room looks and feels. Meal times are fun times, and this mood should be reflected in your dining room space. Proper lighting can make your dining room to appear inviting, warm and cozy with an ambiance that makes everyone around the room comfortable and relaxed. If you are planning to light your dining room, you need to think about the display. You need to provide enough light but still maintain an intimate decorative appeal. You have to consider your furniture, i.e., the table and the chairs. This way, you will be able to maintain a balance throughout the room and still provide enough lighting around the dining table. When planning on the lighting system of your dining room, there are a lot of factors to consider than just choosing the light fixture. Remember, light fixtures come in different forms and shapes. They have different lighting capability and effect. Different types of lighting fixtures will give you different levels of brightness, for example, some light fixtures illuminate a soft, subtle glow, while others give off a bright and direct light. It is therefore important to understand the kind of atmosphere you want your lighting fixtures to bring out. What kind of emotion and effect should your dining room lighting reflect? Do you want a fun and interesting kind of space? Or would you want a soft glow with an inviting, cozy ambiance? Whichever way, type of lighting fixtures you install should look good for all your dining times, whether its lunchtime or late dinner time, the mood should always be well displayed and reflected by your lights. As mentioned above, lighting your dining room should be a well-thought plan that will not only set the right atmosphere for the room but also look spectacular while maintaining an aspect of functionality. Choosing light fixtures for your dining, it’s not something that should be done haphazardly; rather, the process should be planned carefully. You should keep in mind the essential aspects such as the room size and the furniture. At the end of the day, you still need a lighting system that is practical and not distractive. Here are essential factors and tips that will help you plan and choose the right light fixtures for your dining room. Before you decide on the type of light fixtures to buy and install, you need to have the right measurements for your dining room and table. The light fixtures that you need to be fixed should fit well in the room without overcrowding it. They should not be too minimal such that the end up not getting sufficient lighting. The table in your dining room is the focal point of the room, and so the light fixture that goes above it should be the right size. In case you are planning to install an open space lighting system, you need to get the measurements of the dimensions of your dining room. 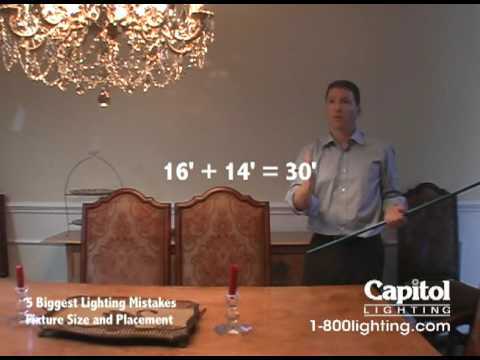 When taking measurements, you should consider how much space you want your light fixtures to take. The number of light fixtures and spacing will depend on the size of your dining room and the size of your dining table. For example, if you have a dining room of about 10ft x10ft or less, you should install light fixtures that are not more than 20 inches in diameter. If your dining room is about 11 feet to 13feet wide or long, you should consider installing light fixtures that are about 24 to 27 inches in diameter. For a bigger room of about 14 to 18 feet or more, consider choosing light fixtures of around 24 to 36 in diameter. However, these measurements do not mean that your light fixture options are only limited to the traditional chandeliers or even the single pendant light fixtures. You have the freedom to choose the light fixtures that interest you only that you have to maintain the right spacing during installation. This is why taking measurements of your dining room and the table is essential. Your home’s décor, style, and the theme will determine the kind of fixtures you install not just in your dining room but also in the entire house. What kind of décor style do you have in your home particularly in your dining room? Is it traditional, modern, or a mix of both styles? Does your house reflect a colonial classic and timeless style? Or have you settled for a modern, stylish and elegant setting? Or, is it eclectic? Consider buying light fixtures that fit or match the style of your dining room and your home altogether. The kind of light fixtures you choose should reflect and enhance your homes current décor. Every little aspect of the décor in your dining room and maybe the adjacent rooms should be in line with the kind of lights of choose. You want to create a seamless transition that still maintains the theme of your home, and the type of light fixtures you plan to install should enable you to maintain your home’s style. The shape of your dining table matters when it comes to the dining room light fixtures installation. If you have a long table of more than 6 inches in length, you might have to consider a linear fixture that will ensure a balanced lighting arrangement. Alternatively, you can install two light fixtures with some space in between. This one can be a great way to make a beautiful statement and still light your table area adequately. The length and shape of your table should be in sync with your light fixtures. The way you space them should be in such a way that the display complements the overall setting of the dining area and still provides practical and functional light for everyone. What quality of lighting are you looking out for? Do you want to brighten the dining room? Or do you want a subtle glow that brings out a romantic kind of ambiance? For example, if you go for a sparkling chandelier that is surrounded by bulbs and lots of crystals, you will have a bright room with romantic shadows kind of effect. You can still adjust your lighting needs by switching off some of the bulbs to maintain the ones with lower wattage to achieve a subtle atmosphere. However, as much as chandeliers look good, some people are just not into them. If this the case with you, you have the freedom to use different types of light fixtures. A pendant gives you various lighting options and can still get you the quality of light you like by installing it. It can give off a task light or a directional light that lights up the table area. This way your dining table and the sitting area will have ample lighting and the people sitting around the table will have enough light cast downwards. When choosing pendant light fixtures, you should know that the size of the fixture depends on the size of the area to be lighted. This means that if a pendant is small, it will provide light to a small area. So the size of the pendant fixture you buy should be enough in size to provide enough light for the room, the table and the sitting area. In addition, the quality of light from you get from your light fixtures will depend on the type of material that your light fixture is made of. For example, if the light fixture is made with a transparent material like glass, it will direct the light downwards while still filtering it outwards. If you choose a light fixture that has a translucent material, expect to have less light projecting outwards. If you go for an opaque material, you will have more direct light casting down from the opening of the light fixture. As mentioned, the size of the fixture will also determine the amount of light you are getting. For example, hanging four small pendants in a linear display may look beautiful, but if they have a small opening, you will be getting inadequate light or more of a spotlight quality instead of achieving the diffused light that pendants give. When choosing lights, it’s important to consider the ability to control and change the amount light you get. Can you be able to change the mood and ambiance of the dining room with your lights fixture? For example, you may want to change your dining room from a fun, bright family atmosphere to a romantic mood with a subtle glow. To be able to achieve this, you should invest in dimmers. This way, you will be able to control your lighting needs and quality to suit a particular mood and also customize your lighting system. When planning to install light fixtures in your dining room, you need to think about the height of the ceiling and how high you will hang the fixtures. You do not want to have a scenario where the light fixtures are too low such that they will crowd and overwhelm the room or too high such that they get lost in the space. This also applies to the size of the light fixture. When choosing light fixtures for your dining room especially above the table, you should keep the height of the ceiling in mind. Additionally, height and the width of the dining table also come into the picture. Also, do not forget to factor in the size of the dining room. These are the aspects that will enable you to determine how high your lights should be hung, and the size of light fixtures appropriate for your dining space. Generally, you are supposed to hang your light fixtures at about 30 to 34 inches above the dining table. You can also hang higher at about 36 to 40inches above your table if your ceiling height is more than 8 inches long. Thus, before you settle on the type and size of fixtures to buy, take your ceiling height measurements. This way you strike a balance between your light fixtures and the dining room space. When shopping for light fixtures for your dining room, don’t concentrate too much on the decorative aspect and forget the basic reason why you are installing the lights which is to provide adequate lighting for everyone. Always choose lights that will enable you to operate and carry out your tasks without distraction. Functionality should be your first consideration. As mentioned some lights might look good but provide inadequate light that makes the people using it uncomfortable. Or, the lighting option might be too bright for some people. Therefore, as you shop for the light fixture, put all the factors into consideration, and settle for practical lighting fixtures that will fulfill your requirements and appeal to your taste and style. These are the essential factors that should be considered before you decide on the type of light fixtures to install. As a homeowner you have a lot of light options for your dining room some of which we will discuss in this guide. However, when choosing light fixtures for your dining room, it’s important to try and tone down on the number of fixtures. Installing the appropriate number of light fixtures suitable for your dining room space will bring out the design and style of your room better. If you try to incorporate too many light fixtures in your room, you may up creating confusion and have cluttered look instead. As you consider lighting options, take into consideration your lighting and illumination needs, then add a bit of decorative aspect and try to balance the two. The dining can become the center of your home depending on the way you light it especially if you have an open floor setting. Therefore, the type of light fixtures you choose will have a great impact on how your dining space looks. You have to decide whether you want a formal dining space setting or a cozy, relaxed environment. Your lighting fixtures can also help you achieve different setting and moods for your dining space. When it comes dining room fixtures, the choices are limitless. If you know the dimensions of your room and of the size table itself, choosing light fixtures becomes an exciting adventure. As a rule of thumb, the functionality of the lights should be your priority. After this, you can choose lights that will fit into your style and pleasing to the eye. Here are different types of light fixtures that you can install in your dining room. Chandeliers which were considered to offer a traditional formal set up are now more versatile and work well with a stylish modern setting. They add a sense of sophistication and class to a room and instantly create a beautiful, stunning focal point.They are fancy, practical and most importantly they can fit in any theme, whether traditional or modern. They are available from basic low key ones, to detailed and intricate options that make a timeless statement in your dining room space. They are available in so many options to fit different styles, requirements, and designs. For example, if you want a traditional formal set up for your dining room, you can go for crystal chandeliers which feature hanging crystals that cast a subtle and soft cascading light in the entire room. They cast a light that accentuates the beautiful rich furniture in your room while at the same time providing ample light for everyone. If you have a smaller space or you are looking to achieve a contemporary theme and still want the magic of a chandelier, you can choose the mini chandeliers or candelabra chandeliers. The mini chandeliers are elegant and available in an array of shapes and style. Candelabra chandeliers have a touch of traditional look while at the same time carry an updated technology design which is more convenient and safe. Chandeliers also come in handy for rooms that have high ceiling height. You can make your space more interesting by installing a tiered chandelier. Just as the name suggests, tiered chandeliers are designed with multiple layers of lights that can go up to five tiers. Pendant lights fixtures are another light options that are ideal for most of the rooms particularly dining space. They are a versatile option that is not only practical for various spaces, but they also look elegant and stylish. Pendant lights are usually hung on a single chain and cast ambient light to the table and the adjacent areas of your dining room. Pendant lights can be used to create a traditional and modern theme for your dining area. If you want to highlight your modern furnishings, you can install pendant lights that come with a colored drum shade to cast a light that creates a beautiful contrast. Alternatively, you can achieve a traditional look by installing chandelier pendant light fixtures to get a soft illumination over your table. These are unique light fixtures that are mounted directly on walls, and they are designed to provide a focused illumination. These type of light fixtures can be used in the dining room to cast a low-level light and highlight the furnishings in your space or specific objects. To install them, you need to have access to a mounted electrical box fixed to a wall stud the same way you would install ceiling mounted light fixtures. If you have a significantly large sized dining room, you can install wall sconces on each wall and incorporate them with the ceiling lighting fixtures to achieve optimal lighting. If used alone, wall sconces provide an intimate and romantic glow. You can add candles to the set up for accent lighting. Track lights are designed to provide targeted overhead lights with a soft to a bright glow. They can be used in a modern and contemporary set up. In a dining room, track lights can be customized to light the table and highlight the furnishings in your room. They are relatively easy to install especially if you already have existing overhead lights. They can either be tapped into the wiring and switches or secured in the ceiling using stud screws or drywall. Track lights are designed with metals that incorporate different styles such as long, curved, straight or short. They can hold different types of lights such as pendant lights, mini lanterns, spotlights and many more. The beauty of track lights is that you can control and adjust each of the light to suit your mood and ambiance. For balanced lighting, make sure you install two sets of track lights on each side of the ceiling above the dining table. This way you will have ample lighting for everyone in the room. These are dome-shaped light fixtures that are installed in such a way that they rest on the ceiling surface. They provide warm, diffused ambient light and work perfectly for dining rooms with low ceiling height or limited space. These types of fixtures are fancy and decorative and tend to blend in with the ceilings and the décor of your dining room. Just like crystal chandeliers, flush mount light fixtures also have decorative, beautiful crystals but designed more compactly. If you want to have a soft light with a subtle glow in your dining space, you can go for a three flush mount light fixture designed with spherical glass shades. Unlike the flush mount option, semi-flush mount light fixtures extend from the ceiling and somehow resemble pendant light only that they do not hang as low as pendant lights. The lights are designed to have a lantern, or a bowl or a shade that hangs just a few inches from the ceiling to cast light down to the surface. They come in various designs and styles that allow you to coordinate them with your décor and room’s furnishings easily. Also known as can or pot lights, recessed light fixtures do not hang down, rather they are installed into the ceiling. They provide a focused or overall light without creating shadows or interfering with the lines of the ceiling. They provide a low light that creates a desirable ambient. However, installing recessed lights is a complex task that involves cutting through the drywall and installing a junction box that will provide power for the light fixtures. When it comes to light fixture installation cost, the cost will depend on various factors. Light fixtures involve dealing with electrical wires which can be dangerous if not handled well. Some light fixtures can easily be installed through DIY, but for more complicated ones you will need to hire an electrician. These are lighting tasks that involve meeting the local codes set by the electricity department. For example, installing recessed lights involves laying wires in the ceiling and opening up the drywall and installing a junction box. If you are not conversant with the electrical processes, you may have to consider hiring an electrician to install your dining room light fixtures. The other important cost factor to consider is the cost of the light fixtures. Basic light fixture options are relatively affordable, and some can cost $100 or even less. However, if you are planning to purchase high-end light fixtures with intricate features and qualities, expect to spend over $1000 or even more per fixture. The cost of installing ceiling mounted fixtures such as chandeliers and flush-mounted light fixtures comes at an average cost of $88 to $222. Chandeliers are the most common types of light fixtures that suit dining rooms and can achieve both traditional and modern stylish designs. The ceiling mounted lights are usually mounted on a metal box which is then secured to the joists or overhead studs. The metal box is then connected to the dining room electrical wiring which can also connect to a switch. Professional installation of ceiling-mounted lights takes about one hour or two hours. The total cost of installation will depend on the number of light fixtures to be installed. The higher the number, the more time needed for installation and labor. The process of installing wall-mounted fixtures is almost similar to that of installing ceiling mounted fixtures. The process of installation involves securing the electrical box to a wall and then connecting to dining room wiring. Wall mounted light fixtures include wall sconces, and other modern LED light fixtures. The wall mounted lights create a focused light that creates an ambient atmosphere for your dining room space. The cost of installing wall-mounted light fixture professionally comes to about $90 to $230. The installation takes about one hour to two hours, just the same as installing ceiling mounted lights. As described earlier, pendant lights hang down on a chain from their ceiling mounts to cast light on the surface of the table. They provide low light which creates a cozy soft ambiance. Pendant lights were mostly used in restaurants to create a quiet and a pleasant ambiance. Homeowners have embraced these type of light fixtures to achieve the same effect in their dining rooms. Pendant lights are relatively easy to install due to their lightweight nature. They can be installed into the ceiling drywall using drywall screws. Additionally, since they have low voltage requirements, pendant lights operate separately from a junction box using a larger light. The cost of installing pendant lights varies depending on the existing wiring system and structures in your home. For example, during installation, an electrician may have to install a new switch to enable a convenient lighting point which will add to the cost of labor. The process of installing pendant light fixture takes about one to three hours, and the cost of installation ranges from $95 to $250. Track light fixtures are also another option for lighting your dining room space. They provide a personalized directional light that can highlight specific objects like the furnishings of your room. If you already have overhead lighting in your dining room, installing track can be a simple task as compared to installing them on their own. It’s easier to fix them into the existing wires and switches. If you are installing them alone, the installation will involve securing them to the ceiling using a drywall or stud screws. The process of installing track light fixture takes about two to three hours, and the cost of professional installation comes to about $100 to $250. Recessed lights create a soft and nice ambient for your room. These types of light fixtures are usually not hang like the rest of the lights thus they are not considered as part of your dining room décor. They installed in cylindrical holes in the ceiling and walls thus they provided a subtle illumination without cluttering the space. The recessed light fixture consists of three parts which include housing, trim and bulb. The housing is the ones that host the trim and the bulb, and it’s usually hidden inside the ceiling. Installation of recessed lights is a complex job that involves cutting the drywall and then finishing it. It also involves installing a junction box that will be able to operate each light fixture. The installation process takes around three hours. Expect to spend approximately $175 to $225 for professional installation of the recessed light fixture. Existing wires – the overall cost of light fixture installation will also depend on the existing wiring system in your dining room and generally in your home. Also, you have to factor in the existing power supply, the positioning of light switches and existing set-up for both walls and ceiling area. If it’s a new installation especially on a new house, the electrician will have to run wiring system that accommodates the light fixtures. Also, they will have to install junction boxes and factor in the positioning of the switches. The contractor has to factor in the space to be left for the lights before finishing up with the drywall. The total cost of installing enough fixtures for your dining room can come to an average cost of $970 which will also depend on the type of fixtures being installed. Some types of light fixtures can take more time to install such as recessed lights. If the electrician has to carry out other tasks, for example, add a dimmer or installing a light switch, expect the cost of installation to go up by an average of $105. Older homes that have not been rewired to upgrade their wiring system may require new wiring upgrade to accommodate modern lights. For the modern lights to work efficiently, you need to upgrade your wall outlets, panels, electrical wiring, and amperage. All these electrical systems have to be up-to-date and meet the current codes. Some of the electrical upgrades that an older will require include getting rid of the knob and tube wiring, and aluminum wiring. If your home has any of these two wiring systems, you have to rewire your house and upgrade to the ones that meet the code before you install new light fixtures in your dining room or any other part of your home. The process of rewiring your home will significantly add to the cost of installing light fixtures. Installing light fixtures in your dining room is a great way to your space more interesting with the right mood for family dinners. If you already have your electrical overhang min place, you can install a new a new fixture through DIY if you follow installation instructions. However, you have to make sure that you are using the right installation techniques. A poor light fixture installation can be fatal as it can it can result to electrical shock or even worse electrical fires. This guide will give simple steps that you follow to mount your electrical light fixture in the electrical box. The first thing that you should before you start mounting your new light fixture in your dining room is switch of power supply to the fixture form the electric panel. After switching of the power, confirm that it’s off by switching on the light switch to see if it’s on or off. You can use a tester if there is existing fixture to verify if the power is off. If you already have an on fixture, start by removing detachable parts of the fixture such as the bulbs, covers and any other part that can come off. After, removing the detachable parts, proceed to unscrew any screws or lock nuts that have been used to secure the light fixture to the ceiling or wall. For this process, you will need to have someone by to help you when detaching the light fixture especially if it’s a big and heavy one. Your assistant should hold the fixture as you unscrew it from the ceiling. After you have removed the screws, as your assistant holds it, look at the wires and note the number and the color code. If your homes wiring has been upgraded or your house is fairly new, your wires should be having clear labels. If you have an older home and you are not sure about your wiring system, don’t install the new light fixtures before consulting an electrician. After you have noted how the wires have been connected, you can proceed to disconnect the wires by unscrewing the plastic connectors. Do this by turning the connectors in a counterclockwise direction and then remove the wires from the fixture. Keep the old away. If you are planning to mount a heavy fixture, just know that you will need a heavy electrical box. Generally, mounting boxes are deigned to handle about 50 pounds and not more than that. If you have purchased a heavier light fixture than you’re the capacity of your electrical box, you might have to install a box or fan brace to support the weight of your light fixture. To do this, remove the existing electrical box from the ceiling. You can purchase a fan brace from home improvement stores. A fan brace is designed in such a way that you do not have to drill extra wall in your ceiling to install it. Make sure you get a fan brace that can support a higher weight than that of your light fixture. To install the fan brace, place it through the hole in the ceiling and turn it till it’s securely attached on top of the ceiling. At this point you can use wrench to make sure it’s firmly tightened while making sure the joists are not strained out. Once the fan brace is attached firmly on the ceiling, you can put brackets on top of the fan brace using bolts through the fan brace holes. After this, mount the electrical box into the bolts and fasten it using the nuts. The fan brace works best for fixtures that are installed between ceiling joists. 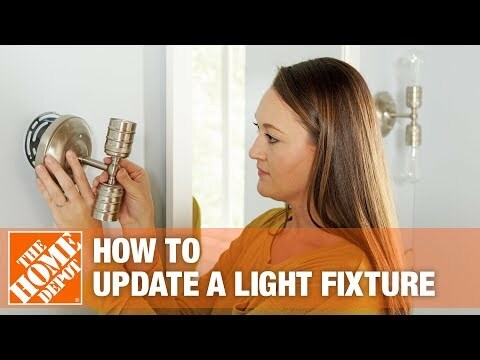 To make your installation easier, make sure you assemble the light fixture first. If it’s a chandeliers, attach and screw all the parts together but leave canopy as this will be attached to ceiling. Also, don’t attach the bulbs, leave them out until later. If the light fixture has a long chain, you can use a pliers to shorten to the recommended height. Remember, the light fixtures should be at least 30 inches above your dining table surface. This way you will reduces of anyone grazing their heads over them and the height will ensure proper illumination. The light fixtures come with a metal bar that has holes. Place and screw it to the electrical box and make sure it’s firmly secured. If your light fixture is to be held into place through a threaded pipe, thread the wires through each part of the light fixture, the metal canopy, and then to the chain holder and finally to the metal holder that holds all the wires intact. Once you have threaded the light fixture wires, you can now mount the light fixture. Let your assistant hold the light fixture or you can hang the chain on the metal hook. Once the light fixture is held into a stable position, you can wrap around the coppers wires to the grounding screw. Using a wire stripper, remove the ends of the insulated wire of the light fixture to about 0.5 inches. Connect the neutral wires of the light fixture the white wires on the electrical box and wrap and twist them together using the wire connector. After connecting the neutral wires, you can now proceed to connect the hot wires together. Join the black insulated wire with the light fixture’s wire by twisting and connecting with a wire connector. Once you are sure you have managed to mount the light fixture and wired correctly, you can secure it firmly into the ceiling using bolts and screws. Once the chandelier is firmly fixed to the ceiling, you can now install the bulbs. After this switch the power supply and the light outlet to see if it lights. If the light fixture doesn’t light, then you may connected some wires in the wrong way. If you decide to check the wiring connection, make sure you switch off the power supply. Alternatively, you can call an electrician if you are not sure of what wrong the installation. If your dining room feels drab and dull and lacks the little magic that makes family dinners exciting, you can change it into a dazzling with by installing new light fixtures. Your dining room should have a sense of warmth, brightness with just the right ambiance. To achieve this, you need to think through your options of light fixtures and settle for one that will match or enhance your style while at the same time illuminating the space with ample illumination. Dining room lighting needs careful preparation. It involves taking measurements for dining room dimensions and the table itself. These are the first steps that will enable you to choose the right number of light fixtures and the appropriate sizes that will not clutter or crowd the room. When it comes to options, the choice of the type of the light you want will depend on your style, the theme of your home and your preferences. Choices of light fixtures range from, the timeless chandeliers, the beautiful pendant light to wall sconces, recessed lights among many others. All you need to figure out your light requirement and the look you want to achieve. Dining light fixtures come all styles, choose what works for you and make you’re a fun place to be.